Kristine Scribner is a partner in the Sacramento office of Lewis Brisbois and a member of the General Liability Practice. 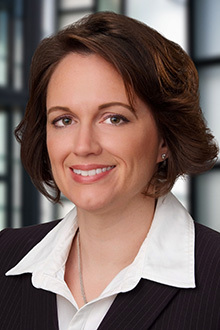 Ms. Scribner graduated from the University of the Pacific, McGeorge School of Law in 2009 with a Juris Doctor and a concentration in Intellectual Property. Prior to law school, she graduated from the University of California at Davis. Ms. Scribner handles a variety of cases including those in the area of general liability, public entity defense, professional liability and employment law. She represents a variety of clients, including local businesses and entrepreneurs and various California public entities in matters involving fraud, breach of fiduciary duty, entity dissolution, real property rights, California Government Tort Claims, intellectual property and trademark registration. In 2017 and 2018, Super Lawyers Magazine named Ms. Scribner as a Rising Star. In 2015, Sacramento Business Journal listed her as Best of the Bar and Sacramento Magazine named her as a Top Lawyer. She is admitted to practice law in all California State Courts and the United States District Court for the Eastern and Northern Districts of California. Ms. Scribner is also greatly involved in her community especially in Sacramento and Yolo Counties. She is a current board member of the Women Lawyers of Sacramento and a volunteer panelist with the Yolo County District Attorney’s Office Neighborhood Court Restorative Justice Program.